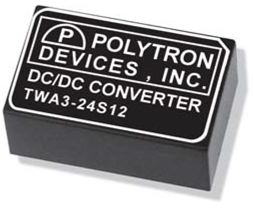 With no external components, our 3 watt single output model of DC-DC converter has short circuit protection, a 2:1 wide input range and new 3.3 Vdc outputs. Dual output models are also available. Ripple Noise of 20MHz Bw: 0.5 - 1% p-p max. Temperature Coefficient (at FL): 0.02% °C max. Isolation Voltage: 500 Vdc min. Switching Frequency: 25 KHz min.